M2Sport are National Distributor for ERREA products. 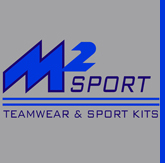 We are based in Galway and we provide a distribution service of quality teamwear, sportswear, training gear and leisurewear to any type of sports for clubs, schools and companies. – Reliable distribution service with delivery of items by catalogue in a week. – 24 hours after sale support and no minimum order requirements. – Free customised brochure for kits and leisurewear in your club colours. – Availability to meet customers anywhere to show the full range of samples.